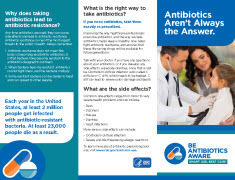 The print materials provide education on when antibiotics are needed and when they are not, emphasize the importance of appropriate antibiotic use, and explain why antibiotic resistance is one of the world’s most pressing public health problems. We encourage you to share these materials with your partners and colleagues. A 2-page trifold brochure with detailed information for patients in a print-only format. 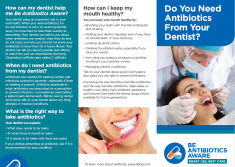 Do You Need Antibiotics From Your Dentist? 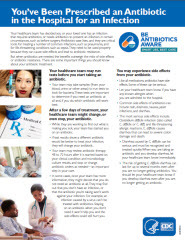 A two-page trifold brochure with detailed information for patients about when antibiotics are needed, the right way to take antibiotics, side effects of antibiotics such as C. difficile infection, and antibiotic resistance. Chart: Viruses or Bacteria — What’s Got You Sick? 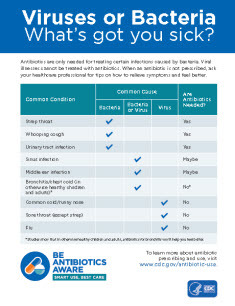 Learn when antibiotics are and aren’t needed. 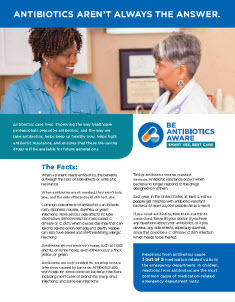 Fact sheet with information about the benefits, risks of side effects, and antibiotic resistance when taking antibiotics and when they are and aren’t needed. In a print-only format. 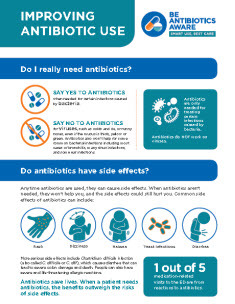 Important information to know about your antibiotic treatment while in the hospital. In print-only format. 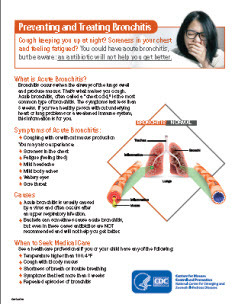 This 2-page, color 8.5″x11″ fact sheet explains acute bronchitis and how it can be prevented and treated. 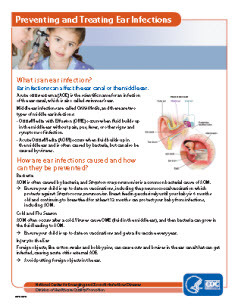 This 2-page, color 8.5″x11″ fact sheet explains the different types of ear infections, and how they can be prevented and treated. Can I feel better without antibiotics? Do antibiotics have side effects? 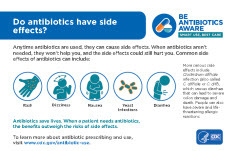 Information on using antibiotics correctly and identifying the side effects. In print-only format.